Let's be honest here – most of us don't do any serious work on our smartphones. They're not really made for that. We use our smartphones to keep ourselves entertained, to stay in touch with the world, and to capture moments of every-day life, not to write term papers or to do our taxes. Given the right apps, however, a smartphone or a tablet can turn into an actual productivity tool – one that's ideal for getting some light work done on the go. The software you need is an office suite. To meet the productivity needs of Android users, the Play Store offers a whole bunch of document viewers, word processors, and anything in between. In the slideshow below, however, you'll find the Android office apps that truly matter. They can open and edit documents, spreadsheets, and presentations, much like the suites available on desktop OSes. Better yet, the apps we have picked are all free, although some do have Pro versions or extra features available as in-app purchases. Check them out! If you've ever used a computer, chances are you've dealt with Microsoft Office. Here's the mobile version of it, available free of charge to Android users thanks to good guy Microsoft. And each app is actually very well made – with easy-to-use UI and all the essential features you'd expect of an app of this kind. Plus, cloud services are supported, making it easy to sync your work files between devices. Just like Word, Excel, and PowerPoint, the Office Lens app is also worth trying. It is Microsoft's "scanner" app, which makes documents out of photos. You can turn a piece of A4 paper into a PDF or Word file just by pointing your device's camera at it. The software straightens and filters the image to make it look its finest. One of this app's highlights is that it has very low hardware requirements and that it only occupies ~25MB of space. At the same time, it is a worthy alternative to the apps we already mentioned, with support for documents, spreadsheets, and presentations across all popular file formats. The Extra Goodies pack adds spell checking and thesaurus. Be warned that the app contains ads, but these don't interrupt your work in any way. Like all other apps on this list, Polaris Office can open and edit documents, spreadsheets, and presentations. It can view and annotate PDFs as well. What sets it apart, however, is that it is Chromecast-enabled, meaning that you can instantly beam your work to a big screen nearby. The app also gets along well with the cloud, making your work safe and easy to share. 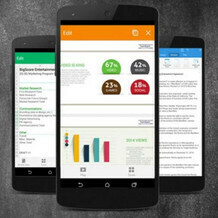 This app may be expensive, but is the most feature-rich office suite you'll find on Android. It lets you create complex documents, with custom headers and footers, with freehand drawings, conditional formatting, and more. Plus, you can work on multiple files simultaneously. Before grabbing the full app, it would be wise to check out the free version or to use the trial one for a while. If you often find yourself doing office work on your mobile device, the investment might be worth it. And if you're not content with any of the apps listed so far, here's an alternative. It supports a broad range of formats, it has all the formatting options you'd expect, it can export your work in PDF format, it can store your data in the cloud, it even has a text reflow mode to make reading on a smaller screen easier. Once you get the hang of the UI, this app can be a useful productivity tool. Which one works the best and is stable? Google's own solution is best on android. Microsoft Office suit (need a active Office 365 license to unlock full feature set) Google Docs, Sheets, Slides and Keep are viable free options. for compatibility? MS I get documents made from various other programs....they sometimes don't display right. As well if you are working with a large company etc, they most likely have MS apps anyways. It's not that strange. Google Docs comes pre-installed on most Android devices, so while it gets downloaded, it's not being used by as big of a percentage of the people who have it. The Microsoft Suite has to actually be sought out by people to be downloaded. Those folks are more likely to review the app since they found it themselves. WPS has no ads! I m using it after trying all the above mentioned apps. Hansoft isn't bad either. THey used to come bundled with Samsung devices in the past.